Going through our archives, we came across this great post by Dr. AnnMaria De Mars from October 4, 2015 “Throwback and some thoughts” that we wanted to share in case you missed it the first time around. 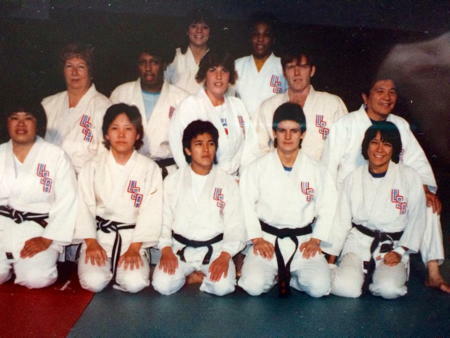 Thank you very much to Jean Kanokogi for sending me this photo of the world team. It’s funny how one picture can conjure up so many thoughts. Both the coaches, Rusty Kanokogi and Jimmy Takemori, have passed away, as did Elizabeth Lee, the manager. When I was younger, I didn’t always agree with any of those three on their views of judo, careers or life in general. However, they all lived according to their own beliefs. What I learned from them most was that you don’t have to agree with someone to respect and appreciate them. If you look carefully at this picture, you’ll see that everyone is sitting properly with their knees bent and hands on their legs except for me. It was not, as everyone believed back then, that I was sloppy and disrespectful of Japanese etiquette. It was because my knee was damaged far more than I let on to anyone but my closest teammates at Tenri Dojo. I had my fist down on the mat supporting my weight because my knee really couldn’t bend. That’s also why I had to lean sideways. I had that knee replaced a few years ago, but back when I was competing, that type of surgery did not exist. You’ll also notice my hand is taped up. I don’t know what the hell I did to my thumb in the Tournoi d’Orleans that year but it was the only international tournament ever that I didn’t place. (Sorry, fifth is NOT a place.) It’s gotten worse as I got older and now that thumb doesn’t work at all. I’m always thinking I should go to the doctor about it but I don’t feel inclined to have another surgery. So, yeah, I was pretty banged up but I won anyway. I think this photo must have been taken after the world championships because I was smiling. I co-authored a book on matwork. It’s about winning on the ground. Hence, the name. You can get it here on Barnes and Noble – write a review, while you’re at it. It was a good reminder, though, of the choices you make about the price you’re willing to pay. So, it cost me a few body parts to win. I’ve never regretted it. It was a good reminder today, as I am in the middle of “the grind” , as Ronda calls it, with our company. There seems to be a vicious circle with our company where I need more people to do the work but getting those more people requires writing the job requirements, raising investor funds for writing grants, that means I fall further behind on the other work so I need those people to start last week …. I better get back to it, since no one seems inclined to do my work for me. You can check out our games here. Fun, educational and done by me! 7 Generation Games – My Day Job! Buy one for ten bucks. ← Do we want rural kids to succeed or not?